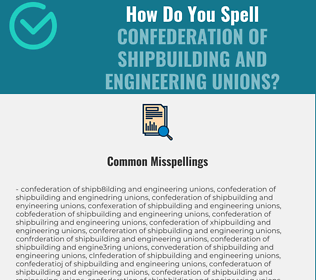 How Do You Spell CONFEDERATION OF SHIPBUILDING AND ENGINEERING UNIONS? Correct spelling for the English word "Confederation of Shipbuilding and Engineering Unions" is [kənfˌɛdəɹˈe͡ɪʃən ɒv ʃˈɪpbɪldɪŋ and ˌɛnd͡ʒɪnˈi͡əɹɪŋ jˈuːni͡ənz], [kənfˌɛdəɹˈe‍ɪʃən ɒv ʃˈɪpbɪldɪŋ and ˌɛnd‍ʒɪnˈi‍əɹɪŋ jˈuːni‍ənz], [k_ə_n_f_ˌɛ_d_ə_ɹ_ˈeɪ_ʃ_ə_n ɒ_v ʃ_ˈɪ_p_b_ɪ_l_d_ɪ_ŋ__ a_n_d ˌɛ_n_dʒ_ɪ_n_ˈiə_ɹ_ɪ_ŋ j_ˈuː_n_iə_n_z]] (IPA phonetic alphabet). 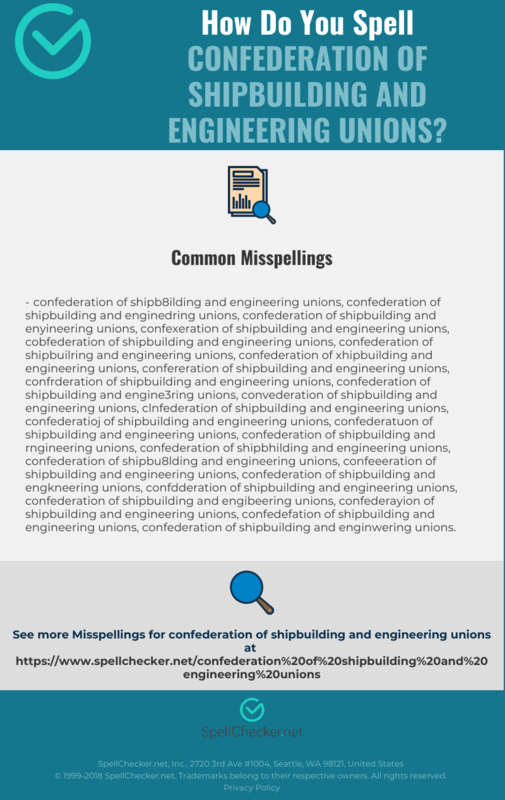 Below is the list of 200 misspellings for the word "confederation of shipbuilding and engineering unions".